Wednesday’s “Day Without A Woman” strike could have cost the United States nearly $21 billion in gross domestic product and thrown workplaces across the country into chaos — if all paid working women had taken the day off. But many didn’t. It was a lofty goal put forth by a broad coalition of women’s right groups, including the organizers behind the post-inauguration Women’s March, to coincide with International Women’s Day. Like the “Day Without Immigrants,” the “Day Without A Woman” strike was meant to show the country what daily life feels like without women — and to hit employers and businesses in the pocket. Women in more than 50 countries around the world hosted rallies or marches to raise awareness of women’s rights and contributions. In the U.S., Women’s March organizers also asked women to take the day off of work — paid or unpaid; not spend money except at women-owned businesses; and wear red in solidarity, a color that has long been associated with the labor movement. Women make up 47 percent of the workforce, according to economist Kate Bahn of the left-leaning Center for American Progress. But it’s unclear how many of those women chose — or were able — to strike. “Even as the economy has improved, there’s still a lot of economic insecurity,” said Elise Gould, an economist with the left-leaning Economic Policy Institute. That point was highlighted by some critics of the march, engaged in an emerging debate over whether women were undervalued, or whether the strike was elitist; “the chasm between the haves and the have-nots is creating tension within the feminist movement,” the Washington Post writes. Some areas across the country have already been inconvenienced. Early Tuesday evening, schools in Maryland’s Prince George’s County announced they would close, leaving parents scrambling to find and pay for child care arrangements for their kids and, in some cases, forcing them to miss a day of pay to stay home. On Monday, Alexandria, Virginia’s school district announced that due to more than 300 staff members requesting the day off, schools would be closed on Wednesday. The absence of seven clerks and one deputy court administrator in Providence, Rhode Island, brought the municipal court to a standstill, reported the New York Times. And protestors in New York briefly brought traffic in front of Trump International Hotel to a stop. Thirteen people, including Women’s March organizers, were arrested. If all women took the day off of work, their absence would paralyze one sector in particular: care services. Women make up 94 percent of employees at child day care services, 88 percent of home health service workers, 97 percent of preschool and kindergarten teachers, and 90 percent of registered nurses. Child care workers, for example, made just $10.72 an hour on average in 2015, according the Bureau of Labor Statistics. That’s $22,310 a year. As Emily Crockett in Vox notes, that’s less than what those working as dog trainers and janitors make. 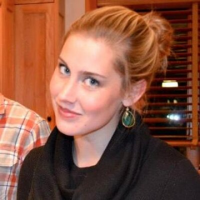 “We devalue jobs that become associated with women … even if they [are] the exact same jobs. “Female-dominated professions on average are paid less than male-dominated professions,” Gould said. “Occupations that female workers flow into see slower wage growth,” she added, citing an EPI study released last summer. With women’s work so often devalued, GDP isn’t the best measurement of how much women contribute to the economy. Even so, women’s participation makes up 43 percent of U.S. GDP, according to Bahn. But that estimate doesn’t include unpaid work. Women spend 150 percent more time on housework and twice the amount of time on caregiving than men. If women didn’t do that unpaid labor, it would be paid for in the form of, say, a housecleaner and daycare — and then it’d be counted in GDP. It’s no wonder then that a 2015 McKinsey Global Institute report estimated that women’s unpaid work amounted to $10 trillion per year. 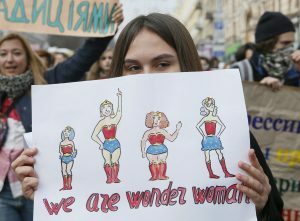 A woman holds a placard during a rally for gender equality and against violence towards women on International Women’s Day in Kiev, Ukraine. Photo by REUTERS/Valentyn Ogirenko. And of course, there’s always the issue of equal pay. “At the median, in terms of hourly pay, women are paid 83 cents on the dollar,” said Gould, citing a forthcoming paper by the Economic Policy Institute to be released tomorrow. Even controlling for race, education, geographic location and work experience, there’s a 22 percent pay penalty for women. For black and Hispanic women, the wage gap is even more pronounced. In looking at median hourly wages, black women make 65 cents on the white male dollar; for Hispanic woman, that’s 69 cents. So, women have plenty of economic grievances. Why, then, didn’t the strike draw greater numbers? Strikes have always been about “low-income people sacrificing wages so you can make bigger gains and gain more power,” Bahn said. When Ruth Gresser, a chef at Pizzeria Paradiso and Veloca in Washington, D.C., offered her female employees the option to take the day off, the idea of a women’s strike “was a little slow to be embraced,” she said. “We were also impacted by the immigrant strike, so the idea of doing another significant action was daunting,” Gresser said. But at least at her restaurants, it caught on: A significant portion, if not all, of the women she employs took a paid day off. Gresser decided to donate half of her restaurants’ proceeds to two women’s organizations — My Sister’s Place, a local domestic violence shelter, and the National Organization for Women. Only half of the food and draft beer menu was made available, a symbolic gesture to underscore the impact of a day without half of the population. 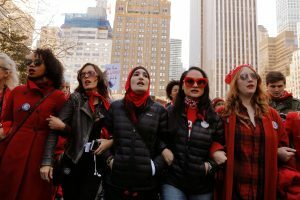 Left: Organizers Linda Sarsour (C), Carmen Perez (2nd R) and Bob Bland (R) lead during a 'Day Without a Woman' march on International Women's Day, March 8, in New York City. Photo by REUTERS/Lucas Jackson.